During the summertime, there are a lot of kids flying off to sneaker camps and tournaments that are aligned with the three biggest grassroots entities: Nike EYBL, Adidas Uprising and Under Armour Association. However, before July gets here, some of the kids end up playing with their high school teams in team camps at major Division I colleges. 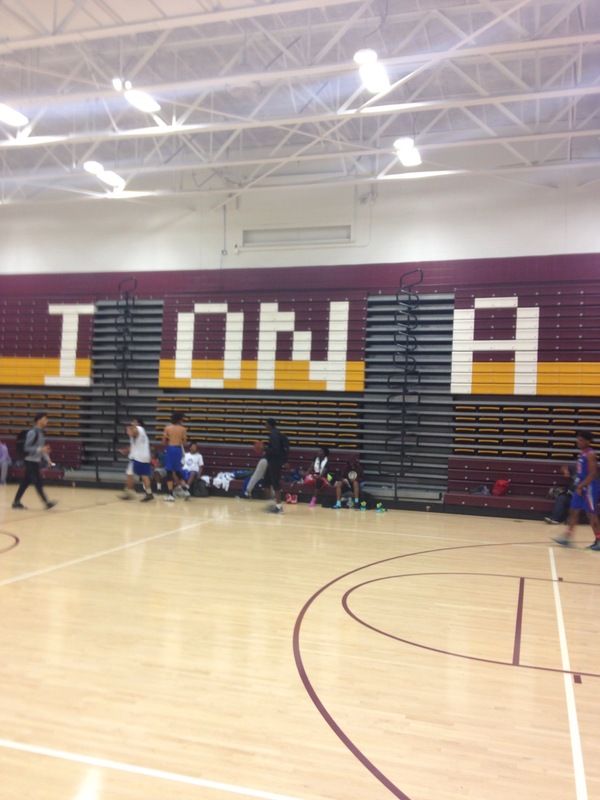 This past Sunday at Iona College, there were many of the tri-state area’s best high school programs in addition to a few AAU programs showcasing their talent for the coaches at Iona College and several coaches from Division II or III schools. Aaron Walker, Cardozo (NY), Class of 2016 – Walker is a speedy guard that is able to distribute the ball. He is an efficient playmaker. He is also a player that can score in bunches. Jared Rivers, Christ the King (NY), Class of 2016 – Rivers is a guard with a good shot selection and is very superb with his ball handling skills. Has top-notch guard skills. Tyrin Flowers, Sacred Heart (CT), Class of 2016 – Flowers has good size and is a great rebounder. He is tall and lanky, but has good ball handling skills. He knows how to put the ball and the floor and is able to get to the basket with precision. Aaron Clarke, Pope John XXIII (NJ), Class of 2018 – Clarke is a point guard with good ball handling skills and has a hot shooting stroke. James Scott, Pope John XXIII (NJ), Class of 2016 – Scott is a pure guard that can dribble and shoot. He can score from anywhere on the court. He also knows how to get teammates the ball. Atiba Taylor, Hackensack (NJ), Class of 2018 – Taylor has a good skill set and is an efficient shooter. He makes good moves to the basket. Klay Brown, Christ the King (NY), Class of 2017 – Brown is a good scorer. He finds plenty of ways to get to the basket. Is very athletic. Has good rebounding skills for a guard. David Cole, Christ the King (NY), Class of 2016 – Cole is a great rebounder and a bruising forward that can be a matchup nightmare in the paint. Ibrahim Doumbia, Arlington Country Day (FL), Class of 2017 – Doumbia is an athletic big man that can rebound well and is mobile in the paint. He is also a good rebounder. Tyler Bourne, Abraham Lincoln (NY), Class of 2018 – Bourne is a small guard with a good jumper. He is superb offensively and is a good passer that knows how to get his teammates to score. Paul Person, Abraham Lincoln (NY), Class of 2018 – Person is a player that can shoot and penetrate through the lane. He is a crafty guard that can get to the basket with ease. Elijah Bailey, Hotchkiss School (CT), Class of 2016 – Bailey is a good guard with playmaking ability. He can also rebound like a forward and is aggressive when going to the cup. He finds multiple ways to score. He is also an adept shooter. Chuba Ohams, Putnam Science Academy (CT), Class of 2016 – Ohams is a dangerous shooter from three-point range. He is very athletic and skilled for his height. He is also a great rebounder. Najja Hunter, Westtown School (PA), Class of 2017 – Hunter is a swingman that is good at moving off the ball. He can also score from different places on the floor. Keith Williams, Bishop Loughlin (NY), Class of 2017 – Williams is a legitimate scorer and gets to the basket efficiently and scores at will. He is also very alert on defense. Idan Tretout, Bishop Loughlin (NY), Class of 2018 – Tretout is a lights-out shooter. He is a good defender and hustles on both ends of the floor. Omar Silverio, St. Raymond (NY), Class of 2018 – Silverio is a player that can get to the basket and finish. He is always able to shoot at a high percentage. Sidney Wilson, St. Raymond (NY). Class of 2017 – Wilson is a forward that is able to rebound efficiently, bang in the paint while also shooting from the outside and is always dominant when going up to the rim. Isaiah Washington, St. Raymond (NY), Class of 2017 – Washington is a playmaker that penetrates into the lane with precision. He is very flashy with the ball and is also fearless when going into the lane. Dallas Watson, St. Raymond (NY), Class of 2018 – Watson is a guard that is a slasher that is efficient at penetrating into the lane at all times. Moves well off the ball also.